NEIGRIHMS MBBS 2017 Admission will be based on NEET Score as per the order of Supreme Court of India. 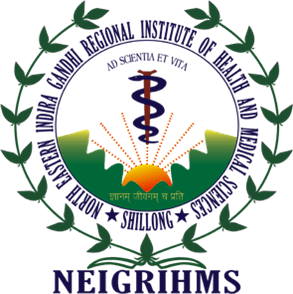 NEIGRIHMS MBBS 2017 is for filling 18 MBBS Seats in the Institute. Candidates belonging to one of the 8 North-eastern states of India including Sikkim are eligible. The distribution of the MBBS Seats is given below. NEIGRIHMS offers admission in Undergraduate, Post-graduate, Nursing and allied profession in medical stream. North Eastern Indira Gandhi Regional Institute of Health & Medical Sciences (NEIGRIHMS), Shillong, is an Autonomous Institute established by Ministry of Health and Family Welfare, Government of India in 1987. This page gives the details regarding the NEIGRIHMS MBBS 2017 Admission which comprises of the information such as eligibility criteria, counselling and selection process etc. The Annual MBBS Fees in the Institute is only Rs. 6000 and the students have to sign a bond with the Institute to complete the MBBS course and the failure to so will invite a penalty of Rs. 10 Lakhs. The NEIGRIHMS MBBS course is recognised by Medical Council of India (MCI) and is affiliated to North Eastern Hill University (NEHU), Shillong. It is a 4 years and 6 months course followed by a 1-year compulsory rotatory internship. The NEIGRIHMS MBBS Entrance Exam is held for filling up of 18 (eighteen) seats only under the NE open seat category. For the seats in Arunachal Pradesh, Meghalaya, Mizoram, and Nagaland the respective State Governments nominate their candidates. All India Seats are filled on the basis of NEET. The candidate must be a Permanent Resident / Domicile of one of the 8 North-eastern states of India including Sikkim. The candidate should have studied and completed their course in the schools located in India in the preceding two years. Age: They should have completed the age of 17 years at the time of admission or will complete the age on or before 31 December 2017. The Higher / Senior Secondary Examination or the Indian School Certificate Examination which is equivalent to 10+2 Higher / SSE after a period of 12 years study, the last two years of such study comprising Physics, Chemistry and Biology (which shall include practical tests in these subjects) and any other elective with English at a level not less than the core course. The candidate must have passed in the subjects of Physics, Chemistry, Biology (or Botany and Zoology) and English individually and must have obtained a minimum of 50% aggregate marks in Physics, Chemistry, Biology / Botany & Zoology in the qualifying examination. Candidates who have appeared or will be appearing in the qualifying examination in March / April 2017 and whose results have not yet been declared can also apply for admission. As per the notification of UGC, the NEET scores is mandatory for admission to MBBS/BDS course in any government and private medical colleges in India. Therefore, to apply for the admission into MBBS/BDS course, the candidates need to submit their NEET score. Although, the admission is done based on NEET scores, yet the candidates have to fill the NEIGRIHMS MBBS Application Form by following the link below. NEIGRIHMS Online Application Form will be available on the NEIGRIHMS website at www.neigrihms.gov.in. A candidate seeking admission in NEIGRIHMS in the MBBS course are required to apply online. It is the responsibility of the candidate to ensure that correct address, email address, and mobile number is entered in the Application Form. Candidate must note that no hard copy of the NEIGRIHMS MBBS 2017 application form will be available. Age proof: High School Certificate / Secondary School Certificate / Admit Card of 10th or 10+ 2 Exams issued by the Board / University showing the date of birth / Birth Certificate of the candidate issued by the competent Government authority. Certificates: Pass Certificate / Provisional Pass Certificate where the candidate has already cleared the qualifying examination. Mark Sheets: Clearly readable mark sheet of the 10+2 examination showing the marks secured by the candidates or HSSLC admit card if the candidate appeared and the result is yet to be declared. The payment of the NEIGRIHMS Online Application Fee would be done through either Offline or Online mode. Both the modes are well described here on this page. The candidates can pay the application fee through any of the modes. The candidate has to write the transaction id and date of the Challan in the column provided in the online Application Form and continue further process filling up of the online Application Form. Candidates will have to upload the scanned copy of the Challan/proof of payment of Fee along with the online Application Form. Candidates are advised to retain a printout copy of the online Application Form and the Candidate`s copy of the Challan/ proof of payment of Fee. Candidates are advised to retain a printout copy of the online Application Form and the proof of payment of Fee. The candidates while filling the application form should check the details filled by them are correct in all aspect before submitting the application form. The candidates should know that once the application form gets submitted, then the candidates will not be liable to do any changes so far in the application form. Hence, the candidates should fill the application form correctly by mentioning the true details. The candidates applying for the NEIGRIHMS MBBS Admission have to pay the application fee of Rs 500. The fee has to be paid through online mode only that is Credit Card/ Debit Card/ Net Banking. NEIGRIHMS Selection of the candidates will only be based on the NEET scores. The candidates need to apply first and then the Institute will release a Merit List and the selected candidates will be called for the counseling procedure. The counseling process will be only base on the Merit List of the selected candidates. Selected candidates shall have to attend counseling and medical examination at the Institute at their own cost on the notified date. Mark Sheets: Clearly readable mark sheet of the 10+2 examination showing the marks secured by the candidate. Candidates who fail to attend counseling/medical examination on the notified date will not be eligible for admission.The Selection/Admission is liable to be canceled if the selected candidate does not report to join the class on the stipulated date without prior permission. It is to be noted that admission will not be finalized unless the candidates produce all the original documents.